This is an immaculate townhouse in the prestigious Gated Village at Brickett Hill, featuring 2 bedrooms, 2 full baths (one in the master) and 1 half bath. The fully-applianced galley kitchen is open to the bright family room featuring a wood fireplace and a cathedral ceiling with skylights. The open living and dining rooms have glass doors leading to a spacious deck and convenient storage shed. 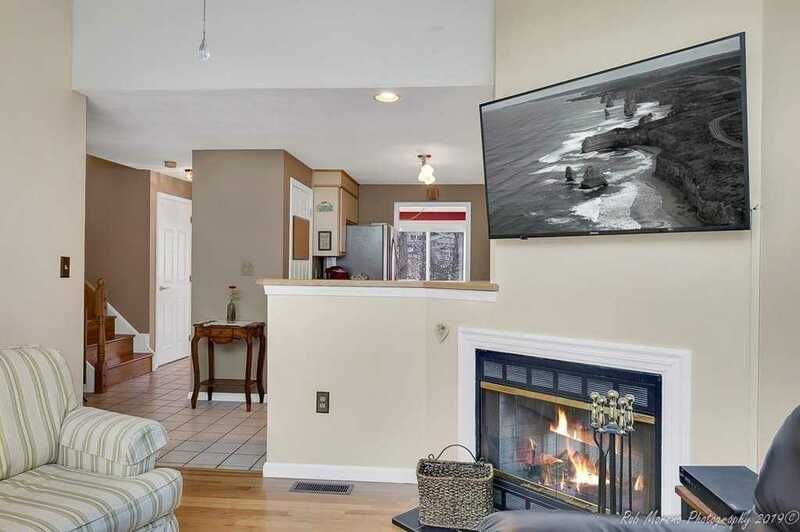 This unit has central AC, forced-hot-air furnace, in-unit laundry, Finished man cave,1-stall detached garage (& extra parking) Amenities include the clubhouse, new in-ground pool, tennis courts, security gates, and more! The country setting, privacy, security, landscaping, snow removal, on-site maintenance & management, overall care of the property, and — PEACE OF MIND — is all well worth the condo fee!!! Minutes to down town haverhill where you will find great restaurants, shopping, train station and a fantastic commuter location. Hurry this will not last!! Please, send me more information on this property: MLS# 72479542 – $294,500 – 54 Brickett Hill Cir Unit 54, Haverhill, MA 01830. I would like to schedule a showing appointment for this property: MLS# 72479542 – $294,500 – 54 Brickett Hill Cir Unit 54, Haverhill, MA 01830.